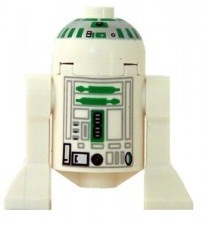 R2-R7 is a green astromech droid Minifigure from the Star Wars theme. Like most other astromech droids, R2-R7 is made up of four parts: two legs (in R2-R7's case, these are white), a body piece with green markings, and a head piece with silver and green markings on it. To date, R2-R7 has made one appearance in LEGO, in the Limited Edition 7665 Republic Cruiser, making the droid exclusive to this set. R2-R7 provided "inflight backup" aboard a Republic Cruiser which transported Jedi Qui-Gon Jinn and Obi-Wan Kenobi to the Naboo system. Whether this droid was destroyed along with the cruiser when it came under turbolaser fire is unknown. This page was last edited on 8 August 2015, at 19:07.